Even beyond developing the phonograph, the motion picture camera, light bulb, and the creepy talking doll, Thomas Edison got a lot done in life. With his even greater knack for enterprise than for invention, he might, had he lived in the 21st century, traded on his reputation for productivity and industry by selling us his personal "life hacks." Alas, those in search of Edisonian tips and tricks for living must infer them from all the materials he left behind after a life that stretched from the mid-19th century to nearly the mid-20th, such as this extensive to-do list from January 3, 1888. That year alone, Edison would execute 45 patents, primarily concerned with the phonograph and cylinder records. Alexander Graham Bell and his associates had begun to make improvements on Edison’s decade-old phonograph, which pushed Edison into action. Despite this competition, Edison's 'To Do' list shows that the phonograph wasn’t the only thing on the inventor’s mind." These five pages of things to acquire or create (see the full list below) include not just the "New Standard Phonograph" but an "Improved Magnetic Bridge for practical work," "Uninflammable Insulating Material," a "Box balancing System," "Artificial Mother Pearl," "Butter direct from Milk," "Artificial Ivory," "Marine Telegraphy," and a "Long distance standard Telephone Transmitter which employs devices of recording phonograph." 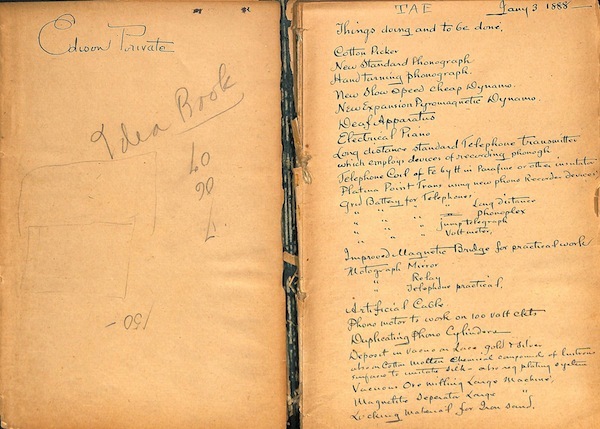 While not all the ideas that inspired, or were inspired by, the items on this long list came to fruition, Edison clearly saw value in getting them all out of his head and on paper. One wonders what the man who declared that "genius is one percent inspiration, ninety-nine percent perspiration" would make of the countless organization and productivity tools now on the market. Nobody ever perspired because of using an app, after all — but plenty have perspired developing them. Large Phonograph for Novels, etc. Very Loud Motograph telephone with 1/3 siz phonogh motor. Dynamo or motor long tube in long magnetic field top + bottom contacts forcing water through generator current by – passage. I wonder how many of these things are yet to be invented? Does anyone know if all the imaginary things he thought about have been invented? Edison gets much more credit than he deserves. This man stole the credit for all his inventions (including three light bulb) from those who are the true geniuses. He swindled Tesla (and others) out of $50,000 and made a campaign to discredit him. This also resulted in Edison intentionally electrocuting countless animals including an elephant. This is just the tip of Edison’s scum-baggary. Needless to say, he was actually a very bad man.